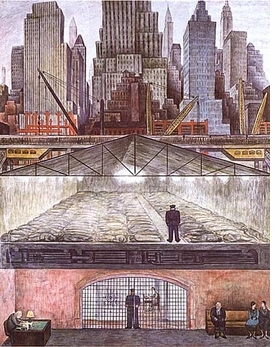 Reproduced from Diego Rivera: Murals for the Museum of Modern Art, "Frozen Assets," left, is one of the "portable murals" that Diego Rivera created for his show at The Museum of Modern Art in 1931. 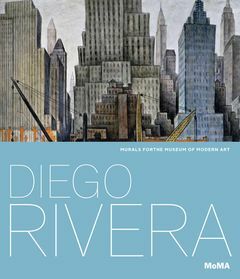 "Diego Rivera: Murals for the Museum of Modern Art", at MOMA, revisits the high tide of the artist's American success. The show reunites three of the five frescoes that Rivera created on portable supports of steel-braced cement, in 1931, for what was the museum's second solo exhibition, the first having been devoted to Matisse. It includes two other frescoes that Rivera made in New York at the time, along with studies and preparatory cartoons, documents and technical analyses. FORMAT: Hbk, 9 x 10.5 in. 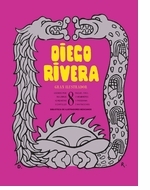 / 148 pgs / 110 color.